Novi, Michigan - June 4, 2004--We first saw C6 at the L.A. Auto Show back on January 5th (/specs/c6/2005/intro.html), and everyone on the Corvette Action Center staff wanted to drive it, but Chevy made us wait for five long months. Late last Spring, we heard media ride-and-drives had been scheduled so we began pleading our case with the Bow-Tie guys' communications staff for an invitation. After getting beat-up for several weeks, they gave-in and invited us. Then, (sigh) we waited a couple more anxious weeks (at this point, I truly was considering Zoloft) while A-listers drove the car at a media event in the Piedmont hills of Virginia. Almost six months to the day after I saw the car on display at L.A., I threw my laptop, Nikons and some clean undies in a bag and caught a jet to Michigan. 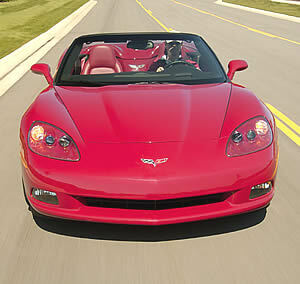 Friday morning, June 4th: finally I was actually going to drive a C6 but, after all this freakin' drama, what happens? No keys! 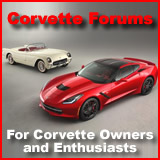 With the all-new, oh-five Vette, you don't need a key to get in it or start it. The whole time I drove it, the keys lay inside the little compartment (covered by the now almost-famous "tambour" door) where the cup holders are. There are no keyed door locks. To get in a C6, innovation and technololgy rears its ugly head: step close to the vehicle with the "keyless access transmitter" (uh...didn't we used to call these things "key fobs"?) and the doors unlock but, don't listen for lock operation because there are no mechanical lock parts inside a C6 door. It's all electronic. If the car's security system determines the transmitter is not in proximity, it disables the door latches; oh yeah, they're electric, too, so there are no door handles on the outside of the car. When the security system senses the transmitter, the membrane switches in the inside edge of the door skin become active and you touch them with your fingers to operate the door latch. Ok. What happens if you have a loss of power when people are in the car. Are the hapless C6ers doomed? No. This won't end up the theme of a B-grade vehicular horror movie. In the interior, on each side of the car, just outboard of the seats, are emergency door latch releases. Simply pull up on on one of those and the door pops open. What about a wrecked car, an incapacitated driver and/or passenger and a first responder outside the car confronted with no way to open the doors? Well, that's when the they grab their Maglites­or even better, use a "spring-loaded center punch" ­and break the windows. All Ceesixers will learn a new hand movement, called "tickling the membrane". Just kidding. Opening the door on an '05 requires excertion no greater than finger joint movement. 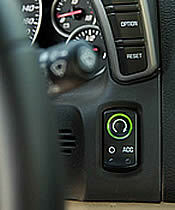 You touch a membrane switch behind that small, black trim piece and the door unlatches. Like C5, the doors weigh very little and open easily. There's no keyed ignition switch in an '05, either. To start the car, press that button on the IP, just to the right of the steering wheel. Actually, it's really not even a "starter button" but a momentary switch that tells the engine computer, "Let's rock-n-roll." From there, all starting actions are automatic. There's a fraction-of-a-second delay while the engine computer checks a few things then signals the starter to operate until the engine is idling. You touch the same button to shut the engine off. Push that green-bordered button and the engine starts. Note the new "international" symbol for engine start-up. "Halverson!" I look up. Yelling at me across a parking lot crowded with media and GM people is one of the Chevrolet officials. "Don't take the keys out of the car!" Hadn't even fired the motor, yet, and I was already in trouble. Nothing new there, huh? At one of those moments when descretion was the better part of valor, I decided that, perhaps, this would not be the day to start a press trip with a long, smokey burn-out. Even with my impromptu, warning chime test session abruptly ending, I still was simply amazed at the novelty of the totally keyless operation of a C6. A few other cars have features like this but it's the first time I'd been exposed to it. I hope GM has got the reliability/durablity of this system well-validated. C5's reputation was a bit tainted by problems to the point of a recall; actually with its electric steering column lock and a similar device is on C6. Also, with the keyless transmitter being a virtual necessity for convenient operation of the car, the transmitters, themselves, have, hopefully, been made more robust. C5 transmitters sometimes had an annoying habit of failing after a few years and cost 80 bucks or so each (ouch!) to replace. If that problem carries into C6, there'll be some happy accountants at GM-SPO, but a few pissed off Ceesixers. On the morning of June 4th, these five 2005 Corvettes, along with several others, awaited media drivers. The colors are (ft-rr) Magnetic Red, Daytona Sunset Orange, LeMans Blue, Millenium Yellow and Machine Silver. That said, the technology in keyless operation of the car is pretty darn cool. Typical of most "press rides", each media "guest" is paired with a GM representative as a ride-a-long. The luck of the draw was that, Tom Peters, Vehicle Chief Designer (VCD) for the C6, was my passenger. As we left Novi, a western suburb of Detroit, on the part of the day's adventure which ran on public roads, I was just as much excited at the prospect of getting to talk to Peters as I was by driving this all-new Corvette. As I'd been sitting in the car for a while, the novelty and anxiety of my first C6 drive had abated somewhat and I became aware of the "Stingray ambience," I mentioned in my first CAC C6 article. Looking out, over a hood which has more of a power bulge and front fenders with peak 10-mm. (about .40-in.) higher than the '97-'04-car, made me think of my '71 Big-Block coupe. 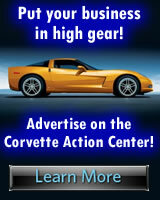 It's a look for which I think many C6 owners will develop a fondness. According to Tom Peters, as you'll read shortly, that's exactly what his team intended. We drove a block over to I-96. In second-gear, I slow-rolled the stop sign as we hung a right on the westbound onramp and, without a downshift, I floored it. In a second and third gear pull, the stronger low-end and mid-range of the new, six-liter, LS2 engine was obvious. Its flatter torque curve is like lighting the afterburner on a jet fighter's take-off roll. Now in 96's westbound lanes, going way faster than legal; I backed-off to 10-over, then shifted to sixth. Peters and I began to chat.